A remote control train is a toy that is loved by kids of all ages. Train sets are a classic kid’s toy that remains popular among tots and teens due to the wide variety of different sets available. Some models of remote control train are stand-alone and can be used on any flat surface; we recommend these to younger kids below the age of 3. While other remote control train models come as a complete set that includes the remote control train, the track and accessories; perfect for starting a collection. There are many different sets aimed at a wide range of different age groups. We considered 20 remote control train sets and tested the ones we felt had the best to offer for a variety of ages. Ultimately, a good remote control train set provides you with all the stuff your kid needs for a fun, driving experience, plus perhaps a few extras. Best Remote Control Trains: Reviewed! This remote control Thomas will be loved by any fan of the popular Thomas the Tank Engine animation. This is a stand-alone remote control train that doesn’t require a track to operate, you simply need a relatively flat surface. The remote control is large and simple to understand making it ideal for kids above two years of age. The controls feature a forward and reverse button, which also allows you to turn the train left and right making it easy to steer. The RC Thomas also gives off genuine steam, which is certainly going to engage and excite any toddler. No need to be worried about heat either, since this steam is cool to the touch. RC Thomas is also able to play a range of interactive sounds and also mutters some of his iconic phrases to make the experience even more exciting. It’s worth noting that this train does require batteries, including 4 x AA for the actual train, as well as 3 AAA for the remote. Therefore, it may be worth investing in rechargeable batteries, since any kid having a good time is sure to get through them in no time at all. This stunning remote control train set complete with a track is the complete ready to play set that will be the ideal gift for any boy or girl. What makes this train set unique in our opinion is that its ready to be played with from the moment it’s out of the box, meaning no extra purchases are required to make it fully operational. However, should you want to expand the set in the future, then additional characters and figures can be purchased to make a beautiful display. 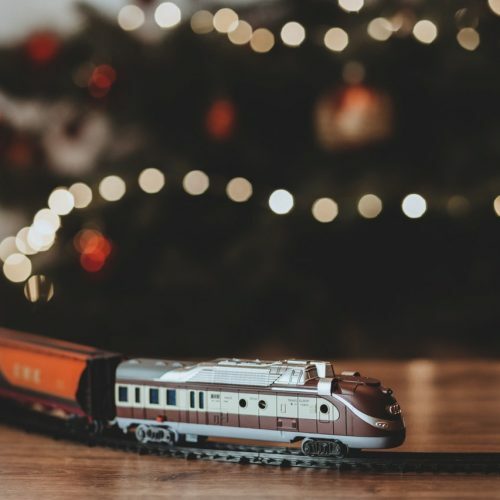 When running along the train track the RC trains engine makes some stunning and authentic train sound effects including the traditional steam engine whistle blowing and bell ringing, as well as a variety of phrases from the popular festive movie – The Polar Express. In keeping with the ultra-realistic feel that this remote control train offers is a working headlight and shadows of the child passengers sitting in the train carriages. The ready-to-play set includes an impressive 24 curved pieces and 8 straight pieces to enable a number of different track configurations to be created. In total, the track measures 50 by 70 inches when placed in an oval set-up, so ensure you make enough room when setting it up! In addition. there’s the option of paying a little more and getting an extra 63 ft. of track, so if you’re looking for a healthy sized track, this is a good option. The remote is also very user-friendly, making this Polar Express model a popular choice with young children and parents. This comprehensive and detailed 888 piece train set by LEGO is the perfect gift for kids aged between 6 to 12 years. When we say comprehensive, we mean it – this large remote control train set comes with everything you could possibly need or want, including the remote control train and the controller as well as enough track to make a complete circular track with 20 curved rail tracks and 8 straight rail tracks. Perhaps one of the biggest strengths of this train set is that it’s compatible with many other LEGO train sets and construction sets, meaning it’s easily expanded and its parts are easy to replace if required. This also means that this set offers maximum creative building and flexibility, which is ideal for the developing child and encourages them to use their own imagination. This toy will provide your little boy or girl with years of fun, and it is extremely strong and durable meaning it will remain in fantastic condition regardless of how many times it’s played with. You could even hand it down to younger siblings to enjoy it will last that long. The infrared controller that accompanies this train set is a little more complex than other RC train toys and there are quite a few small parts meaning it’s more suitable for older kids and not young toddlers. This cute looking stand-alone train is the ideal introduction remote controlled toy for young toddlers. The vibrant colors and friendly face of the Chuggington character are sure to engage any toddler while learning how to operate the remote control. The controls are very easy to learn and feature two simple forward and reverse buttons, making it friendly to use for kids as young as 2. Since the Chuggington is a stand-alone train, it doesn’t require any tracks or small parts. It will run smoothly on most flat surfaces. Should your toddler get bored of the remote control operation, the train can be used as a push along toy, perfect for that young age where a short attention span is a pretty common thing. This outstanding little train set offers a fun-filled experience for the little train lover. Perhaps most appropriate for kids under 5 years of age the GeoTrax railway tracks feature a snap lock mechanism making them extremely easy to assemble and create many different routes. The set also comes complete with all the necessary details to make the adventures extra special including bridges, tunnels and a village train station. Similar to the Lego brand, the GeoTrax range allows you to easily work different sets together since they are all interchangeable. The fact that the tracks can be arranged in a wide variety of different arrangements means that your little one will be challenged, which is great for their development. Your toddler will also be gaining problem-solving skills as they will be encouraged to put together a functional route and make it all click together. Although the Timbertown set by GeoTrax does come with an easy to use remote control, the train and accessories can also be moved by hand should your little one struggle to get a hang of the remote. As mentioned the tracks are compatible with other sets in the GeoTrax range making them an ideal kids gift and something they can build on as they grow, or simply if they want to have a unique and fun collection of toys that can all work together. In our view we believe that the LEGO City Cargo Train set offers the best value for money. It is compatible with a wide variety of other LEGO sets, meaning your child can create their very own little world with ease. The train set is more than a remote control train though, it offers a lot of scope for teaching your child how to problem solve and improve their motor skills. It may be one of the most expensive options from the ones we reviewed, but this set is highly versatile and can be enjoyed by parents and kids alike as they work together to build and create little adventures they will share forever. Plus it’s highly durable and can be enjoyed by kids above the age of 6 in a wide range of different age groups.